Take this quick quiz. You've just received $200.00 and you can only use it in one of four ways. Which would you choose? a) Have dinner at a fantastic restaurant with your significant other. b) Get a new ipod. c) Take a day trip to Kyoto. d) Buy a few mushrooms. Believe it or not, there are actually people out there who would choose d). 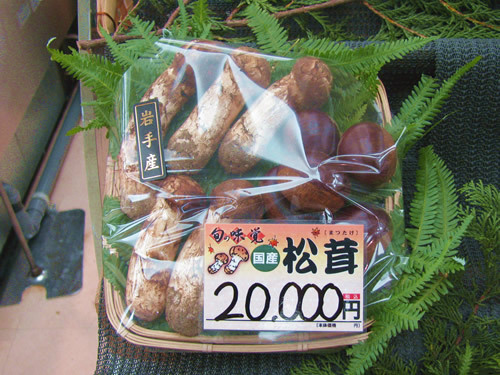 Only in Japan would someone willingly pay 20,000 hard earned yen for some fungus. Still, the question remains, what kind of mushrooms can command this kind of price, and how good can they be? The first question was easy enough to find out. 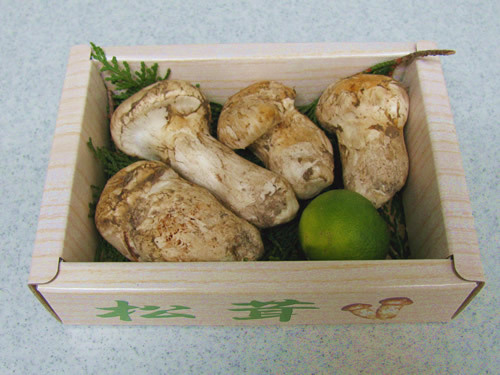 They're matsutake mushrooms, known in Japan as the 'King of Mushrooms'. Tasting them for myself proved to be a bit harder though. My choices were limited to stealing some, heading into the woods to scavenge for my own, or finding some cheaper varieties. Thankfully, cheaper varieties do exist. The super expensive ones are the ones plucked here in Japan, where it turns out they are extremely rare. The imported ones (usually China or the USA) are way cheaper as they're more easily found. 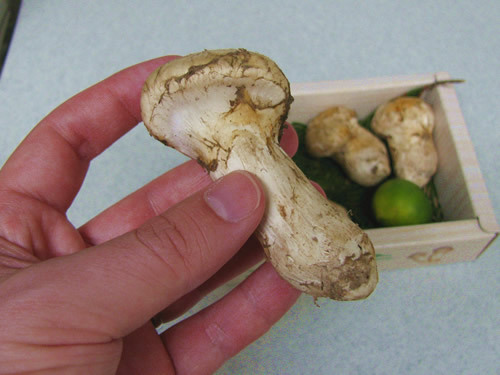 I got this box of American matsutake for 1000 yen, which I was pretty happy with until I realized that I'd just paid 10 bucks for four puny mushrooms. Paying $10 may be better than paying $200, but it's still pretty silly. According to the internet, matsutake mushrooms can only be found in the autumn, and only near a few select tree species, notably red pine. They form a symbiotic relationship with the tree's roots, and interestingly, never grow in the same spot more than one time. So once you pick that mushroom, you're in effect changing the course of mushroom history. So now that you've got your matsutakes what do you do with them? The internet wasn't too helpful with recipes, and most of the ones I did find were wildly complex, like putting them in stews and adding them to 6 course meals, etc. 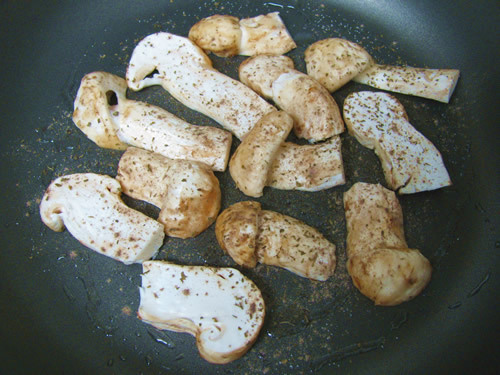 Eventually I found a simple recipe that instructed me to fry them with a bit of salt, pepper and parsley. So I complied. Make sure you rinse and scrub off the dirt first. Cooking method: Turn the heat on to medium, cook them for about 2-3 minutes on each side until golden brown. 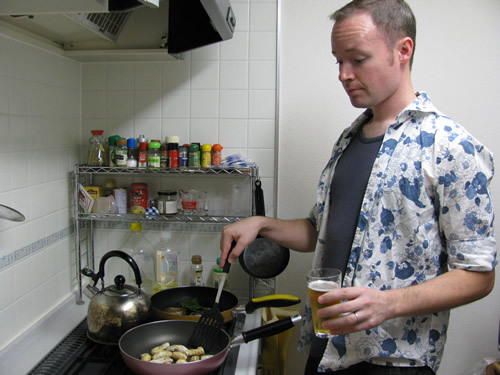 A beer in the hand also helps to get you into the matsutake mood. Voila! 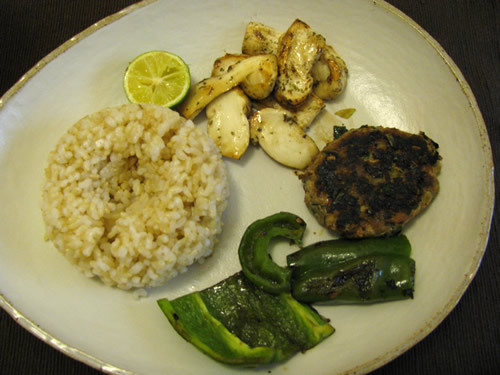 Dinner is served (burning your hamburger is optional). So how did they do? Pretty darn tasty actually! 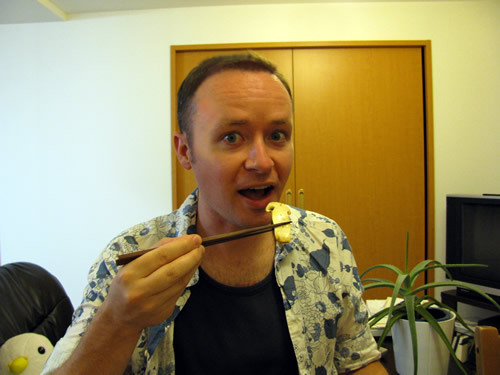 Worth 1000 yen? Well let's not get too carried away. Still, if you're a mushroom lover, you'll go nuts for matsutakes. They have a very smooth, and creamy texture, with a woody smell reminiscent of pine trees. The flavour is kind of hard to describe. The taste is rich and deep, but yet not overpowering. It's really something that needs to be tried first hand to understand.